I have a workshop coming up at my church in February and as a part of the workshop I am creating this blog post to assist in putting the kits together. I am calling this card Confident Encouragement. I think it would be a great card for a graduate or someone who has embarked on a new career. I've created a video to show you how to put together the kits I created for this workshop. If you were not at the workshop or want to create the card again using your own paper here is the cutting information and other supplies I used in putting the kit together. 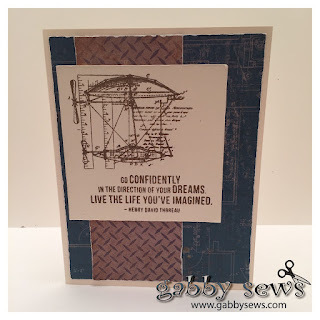 Urban Blueprint Paper - 4" x 5.25"
Urban Diamond Plate Paper - 2" x 5.25"